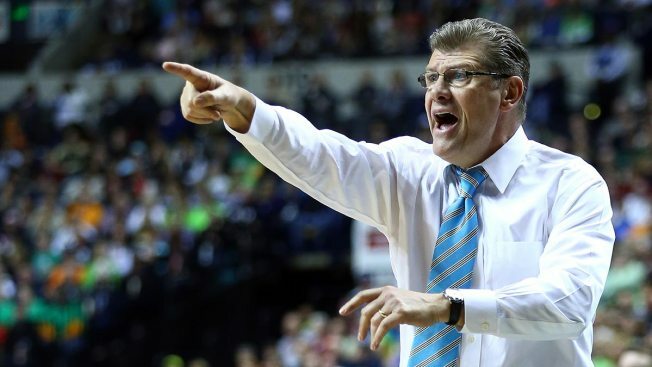 Top-ranked UConn made it a priority to get off to a fast start in the postseason after trailing early in its final two regular-season games. Morgan Tuck and Katie Lou Samuelson each scored 16 points and UConn routed East Carolina 92-51 Saturday in the quarterfinals of the American Athletic Conference Tournament. Breanna Stewart added 15 points and eight rebounds to a balanced scoring attack that had five Huskies (30-0) reach double figures. UConn put the game away in the first half. They outscored East Carolina 32-19 in the first quarter and led by 30 points at halftime. The win gives the Huskies their 11th straight 30-win season and 21st in program history. It also extends the third-longest winning streak in program and Division I women's basketball history to 67 games. The Huskies need three more to catch the UConn teams that won 70 in a row between November 2001 and March 2003. "We aren't the start of what UConn is," Tuck said. "So, we try to continue the legacy going on." UConn will play Tulane in the semifinals on Sunday. Jada Payne scored 16 points and fellow senior I'Tiana Taylor added 14 for East Carolina, which finishes its season at 13-19. UConn shot 59 percent from the field, making 41 of 69 shots. They outrebounded the Pirates 42-20 and outscored them 64-14 in the paint. The Huskies trailed Tulane after one quarter and South Florida at halftime a week ago, before winning those games going away. They put this one away early, jumping out to a 14-5 on a layup by Kia Nurse. Samuelson had six points and an assist during that stretch. A 3-point play by Stewart made it 26-9 and the Huskies led 32-19 after the first quarter. UConn made 14 of its first 19 shots. "We just went out and had a lot of fun," Stewart said. "Shots were going in. In the last two games we played in the first half, shots weren't going in." UConn took its first 30-point lead when Gabrielle Holston dribbled the ball off her leg, Moriah Jefferson stole it and found Nurse for a layup. That made it 52-22 at halftime. East Carolina scored the first five points of the third quarter, but the Huskies responded and extended their lead to 66-31 before emptying the bench. Gabby Williams made seven of her nine shots from the floor and finished with 15 points. Nurse added 13 points and Jefferson had eight points, seven assists and four steals. The Huskies, looking for their third straight conference title, are 7-0 in the history of the American tournament. They are 61-0 against American Athletic Conference teams since the league was formed, winning all of those games by double digits. The closest call was an 84-70 win over South Florida in last year's conference final. "I think it drives probably every coach in this league to, every single time you play them, you work to close the gap," East Carolina coach Heather Macy said. "But the gap is very, very large." Payne, who scored her 2,000th career point in the Pirates' first-round win over Cincinnati, finishes her career with 2,029. "It's been a long road and it's been a lot of fun too," she said.